I'm always a fan of pink! I thought it would be fun to pair a crème, Don't Mesa With My Heart, with a shimmer, Don't Desert Me, as a gradient and I'm pretty pleased with the results. I think the two finishes play nicely together. The pink crème, 'Don't Mesa With My Heart,' is definitely not unique but I'm still digging it. It's pretty! You can see my swatches and review of this polish and the others in the China Glaze Desert Escape Collection HERE. I added a couple of small black pearls and right after I did it I regretted it! I think they take away from this mani. On this macro you can see how the crème and shimmer play off each other, they bring out each others good side lol For the stamping I used Bundle Monster Black Noir and stamping plate BM-718. Wow I really had to push through writing this post! I suddenly just don't have much to say, maybe I should go to bed lol So, pink. Are you into it? Do you hate it? Gorgeous mani! 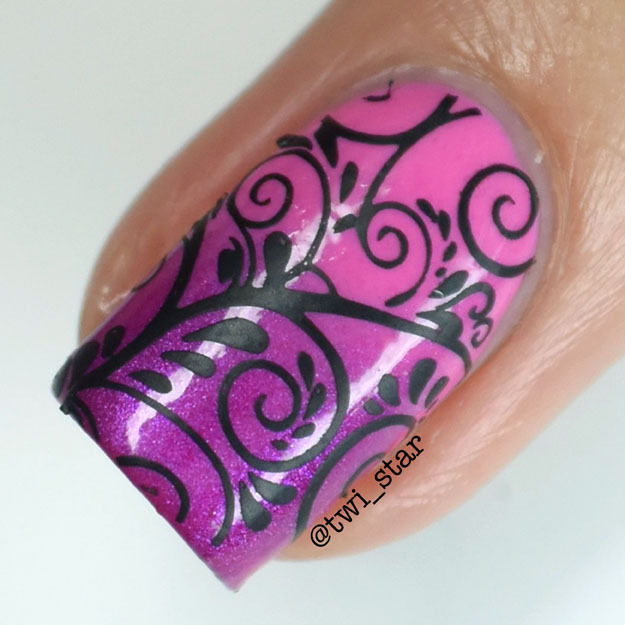 I love the gradient with the stamping! The gradient is so perfect! The whole mani looks very lush and pretty. You really have a way of meshing things together so well. beautiful!! love that subtle gradient! Thank you! I love how the pearl finish looks with the crème. Love the gradient and stamping!! There isn't anything about this I don't love. Perfection! OMG I LOVE IT SO MUCH!!! That hardly looks uninspired! It's lovely!